A fabulous old bar and pool table sit in the middle of this cozy place, lesbian owned and operated since 1962. A Treasure in Bernal Heights! Visiting this bar always makes me happy! Their drinks are delish. Their staff are on point. And the out back patio and garden area is relaxing, inspiring, beautiful, revitalizing, and practically perfect! Wanna be happy too? Visit Wild Side West! Wild Side is a totally casual, welcoming neighborhood bar. I've had only pleasant interactions with both bartenders and other patrons here. Everyone is there to relax, play a game of pool, or sip on a drink in the gorrrrgeous back patio (it is not to be missed!). Yes, it's mostly ladies and curves to the older side of the spectrum, but you can't help but find interesting conversation here. 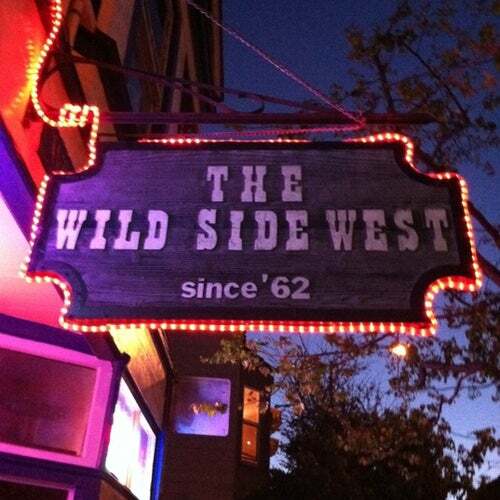 Wild Side West is a landmark, being the oldest gay or lesbian bar in SF. But the lesbian owners have always said that it's a neighborhood bar that just "happens" to get a lot of lesbians. And that's true. It has a warm, smallish interior with fireplace and the pool table Janis Joplin once played pool on (and was reportedly laid on as well). The interior looks very old. Outside they have a back yard. Most places would call it a patio. It's a back yard. And it's perfect for this non-pretentious place where you might as likely meet a radical dyke as a gay male programmer or a straight guy from the 'hood just stopping in for a drink. The staff are friendly types, they mix good drinks, and for major holidays and some birthdays they often have a food spread. I think I'd be there every day if I still lived in the neighborhood. Cozy club, nice woman, taste of history! one of kind, cozy feeling (fireplace). Beautiful outdoor balcony / patio / gardens. I was also intrigued by the history!